JR installation featuring Ali Mohd Younes Idriss in Rio de Janeiro. Photo: Alexandra Pechman. ART AND THE OLYMPICS have a long, intertwined history. The ancient art created in competition to memorialize the earliest games eventually defined the vision of its modern iteration. In the early twentieth century, there were also art matches: Beginning in 1912, artists competed in fields like painting and sculpture, accompanied by exhibitions and new architecture. The tradition ended by 1948, but the 2016 Summer Olympics inaugurated the first artist-in-residency program. Combined with Rio de Janeiro’s new museums and public art competing for the city’s attention, art was an occasional tonic to controversy rather than a means to leave a legacy. The conversations I heard around the city focused on the reality versus the fiction, particularly regarding the Olympics’ reputation for unruliness—a reputation settled before games even started. Impeached president Dilma Rousseff’s trial would begin just days after the Olympics ended. “Imagine that you are going to throw a party, you have worked towards it for several years,” she told the media. “And on the day of the party, someone arrives and takes your place and takes over the party.” At the opening ceremony, Brazilians booed Michel Temer, considered by many the illegitimate president brought on by a coup. The residency injected some positive energy by turning artists loose on Rio, the flashiest of whom was JR. The French street artist erected his signature black-and-white prints on scaffolding around the city, depicting young Olympic athletes from around the world, mainly those who didn’t qualify, blown up to mega-size. (One piece measures nearly one hundred feet wide.) The works appeared to salute Rio’s spirit of grandeur and disruptiveness, with the giant athletes jumping precariously over the top of buildings or diving into the bay. Art institutions (the finished ones) played host to hospitality houses all over the city, often in an accentuation of their vulnerabilities. Japan was housed at Cidade das Artes, the Barra de Tijuca arts complex that opened in 2013—ten years late and at six times its budget, at nearly $300 million dollars. The Modern Art Museum (MAM), located on the Gloria Marina, had half its property cordoned off for parties thrown by SKOL, the watery beer that ends up the official sponsor of everything. And at Parque Lage, home of the School of Visual Arts, the British Hospitality House paid a reported $2 million reals (about $625,000) for the use of the nineteenth-century property. The money will be used to pay off the school’s debts, after the city slashed the staff nearly in half a few months ago. During the final week of the games, the story of four US Olympic swimmers who were robbed at gunpoint was proven false, which an expert told the New York Times “tapped into one of Brazilians’ biggest pet peeves—gringos who treat their country like a third-rate spring break destination.” The same day the incident was reported, the British House at Parque Lage threw a scheduled rave-style party with British DJs. People routinely criticized the city government for prioritizing ostentation over improving the lives of its people. Spearheaded by the International Olympic Committee, the JR installations came with messages of hope and perseverance, with exposed scaffolding that referenced a city still under construction and young athletes still fighting to compete. A half-moon installation soared up from a rooftop in Morra da Providência, the favela where JR’s Casa Amarela cultural center was inaugurated in 2009, after his Women Are Heroes installations took Rio’s streets. While the artist has brought attention to Rio’s favelas, the only impulse he shares with the city government on the treatment of favelas is to aestheticize them—the question is for whom. An aggressive favela-removal campaign will be an enduring legacy of the mayor, Eduardo Paes. Graphic murals appeared along the highway from the airport to hide underserved communities from the eyes of tourists. The new subway line that routed to the Olympic Village bore the names of genteel neighborhoods like São Conrado, a stop that also services the more than seventy-thousand-person population of Rocinha, Brazil’s largest favela. To embrace a position like JR’s as Rio’s own is an athletic leap of imagination about how this city oriented itself vis-a-vis its disenfranchised. Still, JR’s trompe l’oeils are thematically sound: The image of these Olympics, for most people, was not unlike a mirage propped over the real thing. Marc Ohrem-Leclef, Mike, Pavão Pavãozinho, Rio de Janeiro, 2013, color photograph, 20 x 22". Unsurprisingly, art that engaged the myriad problems caused by the Olympics focused on conversations inside beleaguered communities. 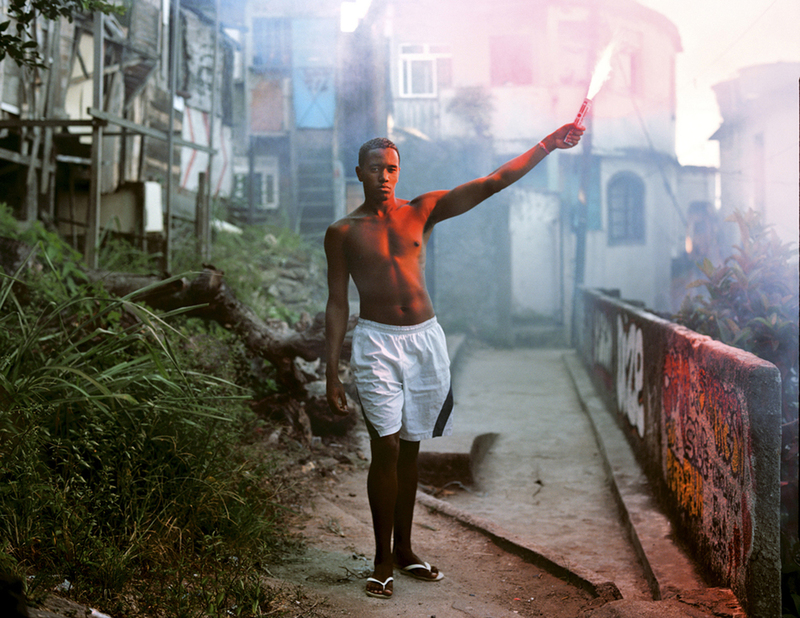 In March, Studio-X Rio showed Marc Ohrem-Leclef’s photo series Olympic Favela, portraits of denizens of fourteen communities set to be removed to make way for the Olympic Park and village. (Works from the project are on view at Baxter St in New York through September 3.) Residents hold up emergency flares like an Olympic torch, the symbolic gesture of progress toward the games reversed into an act of protest against the progress of a bulldozer. In his video work v.a. 4598, shown at Casa França-Brasil a few months back, and now circulating online, the Rio-based artist Igor Vidal performs Olympic weightlifting movements amid abandoned houses and ruins of Vila Autódromo favela, which since 2013 has suffered removals and demolitions resulting from the construction of the Olympic Park. 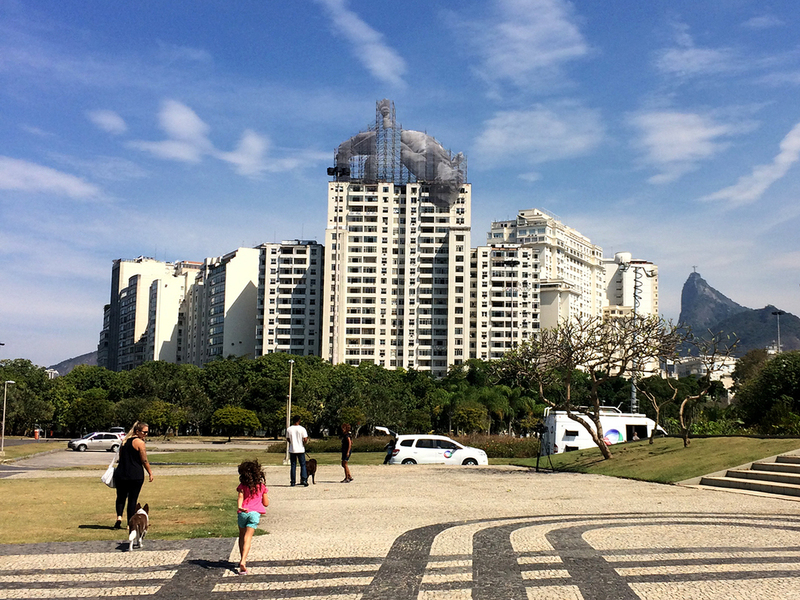 Inside the Olympic Park, Adriana Varejão’s design for the aquatic stadium stood out for what it did not say. Among the antiseptically contemporary buildings I passed in the park, the boxy aquatic stadium is draped in a scrim featuring the work Celacanto Provoca Maremoto, a swirling and violent tsunami. One had to acknowledge the chaos in order to enter the normalized atmosphere of an Olympic stadium, and decide which one was the fiction. At one point I tried to track down the JR installations. I had only seen them in photographs. The only clues to their whereabouts were the landmarks in the official imagery, reprinted in hundreds of news outlets. Based on the location tags of a few Instagrams, I set out to walk along the waterfront of the Guanabara Bay. I somehow ended up almost completely alone, a feat in Rio, on a Botafogo beach clear of tourists. (Guess, those news reports worked.) There I found the best vantage point to see the image of Ali Mohd Younes Idriss, a Sudanese high jumper who did not qualify for this year’s games. He appears outstretched over a building, a likely expensive address; at some angles Rio’s Christ the Redeemer is visible in the background. It was a perfect place to take a picture. It was empty. Alexandra Pechman is a writer based in New York.